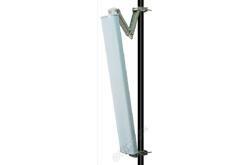 This antenna features a heavy-duty plastic radome for all-weather operation. The mounting system adjusts from 0 to 20 degrees downtilt. This WiFi antenna is an ideal choice for Wireless Internet Provider "cell" sites since the cell size can be easily determined by adjusting the down-tilt angle. Horizontal coverage is a full 120 degrees. 2 inch (5 cm) O.D. pipe max.